Sometimes a publication comes together just the way you want it. 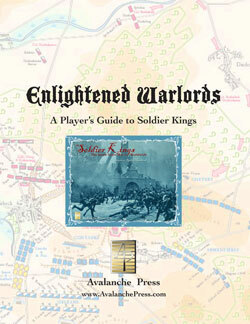 I saw Enlightened Warlords: A Player’s Guide to Soldier Kings as a tightly-focused guide for Soldier Kings, with history, strategy and variants. And that’s exactly what it is. The Seven Years’ War is less familiar to many than the Second World War, and I felt it important to include an overview to bring the game into its historical context. For starters, it’s not actually a war, but multiple conflicts: a myriad of colonial wars, plus the French attempt to seize Hannover to place pressure on Britain (Britain’s King George II also being Elector of Hannover) and finally the Austro-Prussian death match. The events, strange as they are, aren’t nearly as important to informing the game as is the world-view of the times. Despite the massive expenditures by all participants, this is not yet total war. The idea of overthrowing another monarch is literally unthinkable to these rulers. God placed them on their thrones, and only God can remove them. In game terms, that means you can never really knock an opponent out of action. And it’s also an age of continual conflict. There are no neutral powers, there are only enemies you haven’t attacked yet. With little to fear from foreign enemies for their positions and no terror of domestic opposition – a peasant revolt being unlikely to occur and even less likely to succeed – the crowned heads of Europe need not cling to peace. And so they don’t. They break treaties on a whim, attack neighbors with little provocation, and make peace only when they run out of money to wage war. They have little care for their populations – the public sphere has only just emerged, with public opinion in its infancy – or their soldiers, and so battles can and do result in horrendous casualty levels that later armies could never tolerate. Game strategy is therefore a little different than 20th Century power politics. So we have a section with hints for each of the eight potential players, describing their position and suggestions for a path to victory. Spain even has two different strategic guides. The suggested route for victory for some countries takes them down what I consider pretty wildly unrealistic paths. Prussia fighting for Italy, or Austria needing to grab territory in the Caribbean, just doesn’t match up with their objectives in making war. And so each Major Power is given four national aspirations more in keeping with their actual goals. With these in place, a Major Power can win without engaging in strange moves and the areas fought over the most bitterly, like Silesia, take on their rightful importance. Along the same lines, I wanted each Major Power to have more unique flavor. They actually have quite a bit more than one might think even in the standard game, thanks to the relative strength of their armies and navies and the abilities of their leaders, plus the bounds of geography. But I thought they needed more, and so each Major Power now adds two special powers: faster shipbuilding, easier recruiting in some places and that sort of thing. It adds a great deal of flavor and isn’t at all difficult to add to the game. And then there’s a little alternative history. Gamers like to ask “what if” questions, but I don’t know that the Seven Years’ War is familiar enough to most to allow very deep indulgence in this tangent. So what we have are 11 possibilities, one of which you can add to your game as determined by dice roll (with the most likely to have occurred having the numbers most likely to be rolled). Europe spent the first half of the 18th century in constant warfare, and the course of the Seven Years’ War was largely determined by the outcomes of those wars that came before. Even very slight differences would change the goals and starting positions of 1756, and so we have a touch of this available to spice up your game play. And that’s what you get in Enlightened Warlords. Order your copy of Enlightened Warlords TODAY!